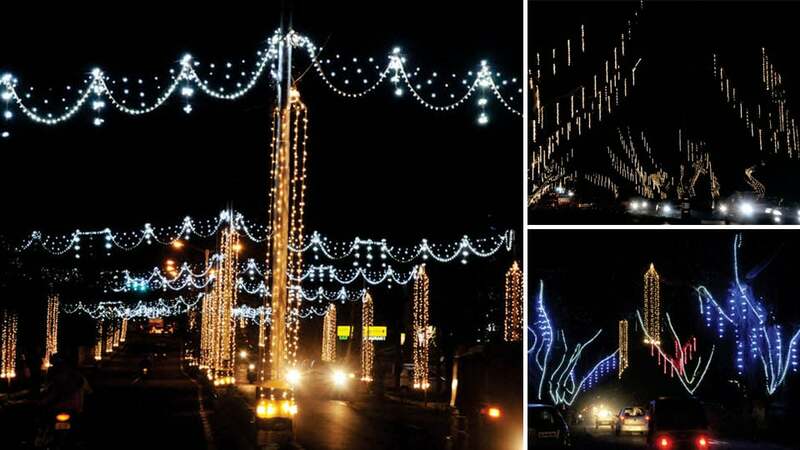 Mysuru: With just five days left for Nada Habba, the Chamundeshwari Electricity Supply Company (CESC) has taken an eco-friendly route to light up the Palace city with LED bulbs this Dasara besides completing the artistic illumination works on a war-footing. Light Emitting Diode (LED) bulbs are being used to illuminate buildings, Circles and streets to brighten up the city and thus the CESC hopes to save electricity. The cost of illumination is expected to be around Rs. 2 crore this year while last year it spent Rs 1.40 crore. The CESC had finalised the illumination plans and sent the final proposal to Dasara Executive Committee. ladders and cranes are used to reach the tip of the Palace to check the lamps. 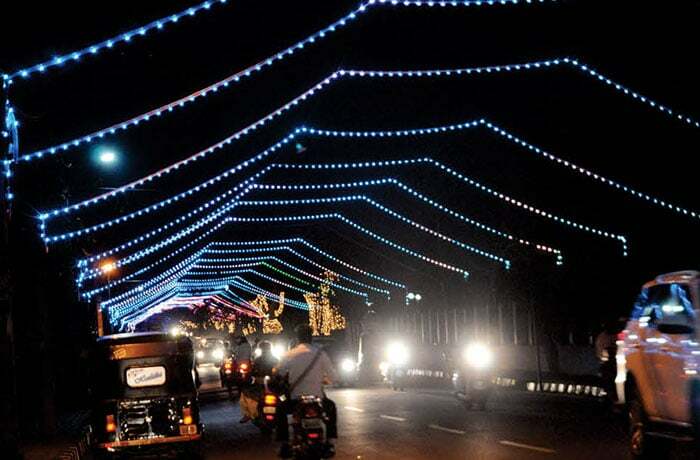 The illumination include a huge arch and green pandal on Sayyaji Rao Road (on the procession route) to welcome tourists; the busy K.R. Circle and Statue will get special attention for lighting, besides the Albert Victor Road, Hardinge Circle, Ramaswamy Circle and Metropole Circle too. 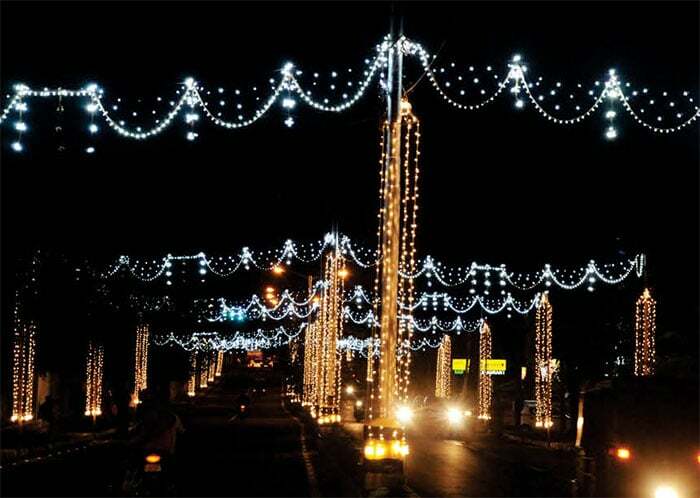 The streets around Mysore Palace and Jaganmohan Palace will also be lit up. Road leading towards Open Air Theatre in Manasagangothri. 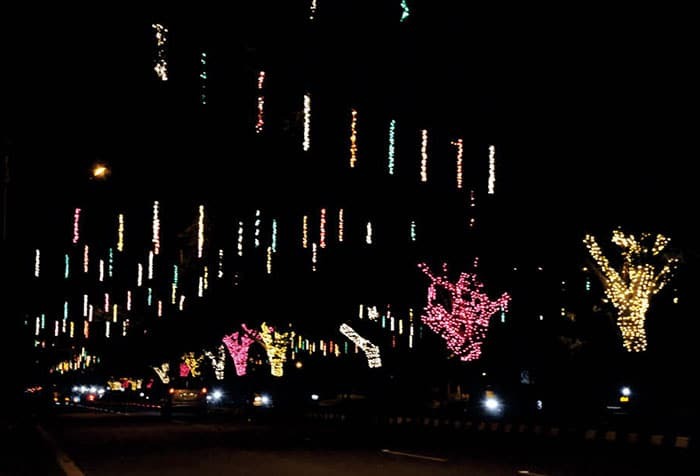 Devaraja Urs Road and Sayyaji Rao Road, prominent shopping hubs too will have special lightings and the CESC is expected to complete the illumination arrangements soon with the trial runs being alreday held at various places. The illuminated Road opposite Gun House. Major roads such as Albert Victor Road, Sayyaji Rao Road, Bengaluru-Mysuru Road, Nelson Mandela Road, Palace South Gate Road, Bengaluru-Nilgiri Road, parking space of Exhibition Grounds, stretch atop Chamundi Hill, Chamundi Hill Road, Chamaraja Double Road, Basaveshwara Road, JLB Road, Krishnaraja Boulevard, Mahishasura Circle Junction to Dasoha Bhavan will be illuminated with Red, Green and Blue colour bulbs. CESC will also put up illuminated models of Jayachamarajendra Wadiyar at CADA Circle, Chamundeshwari model at Kurubarahalli Circle, insignias such as KRS Dam, the Buddha, Basavanna, Mahatma Gandhi, Dr. B.R. Ambedkar, Jnanpith awardees, Nalwadi Krishnaraja Wadiyar and Sir M. Visvesvaraya models at Doddakere Maidan and Institution of Engineers Circle. JLB Road wears bridal look. Darpana Sundari model will be displayed at K.R. Circle, Ashoka Pillar model at Millennium Circle, illuminated replicas of various animals, birds will be put up at Fountain Circle and models of Parliament, Vidhana Soudha at Railway Station Circle, a giant Gandabherunda model at JSS College, insignia of Mysore Palace at Ramaswamy Circle and India Gate model will be put up near Maharani’s College. Kurubarahalli junction towards Chamundi Hill. 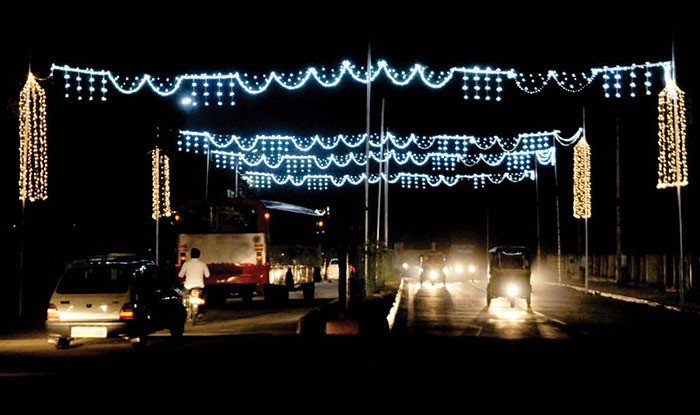 An LED welcome display board will be put up atop Chamundi Hill and ‘Hasiru Chappara’ displaying LED board will be set up on Sayyaji Rao Road. 12 major parks will also glow along with Uttanahalli Jwalamukhi Tripura Sundari Temple. KR Boulevard ready to host Open Street Fest on Oct.13. 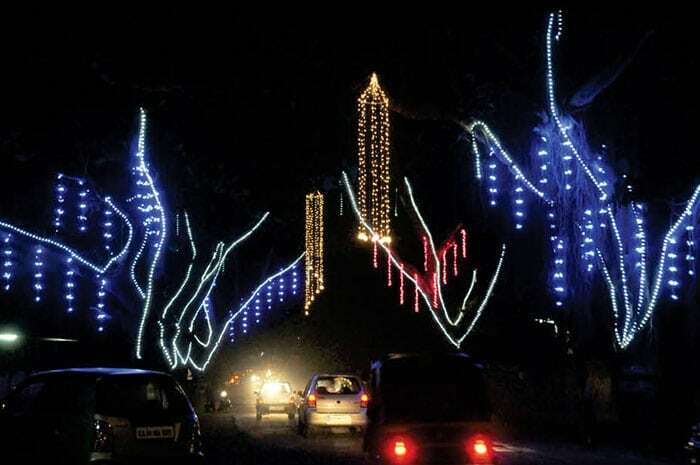 CESC also has sponsorship from private players to illuminate Hardinge Circle, Jayachamarajendra Wadiyar Circle, Government Ayurveda College Circle, Mysuru-Nanjangud and Hinkal Outer Ring Road Junction, Alanahalli Circle on T. Narasipura Road, Lakshmivenkataramanaswamy Temple Circle and Railway Station Circle, Kurubarahalli Circle, Agrahara Circle, Columbia Asia Hospital Circle, JSS Circle, Ramaswamy Circle, Petrol Bunk Circle, Metropole Circle and Gopalagowda Circle. 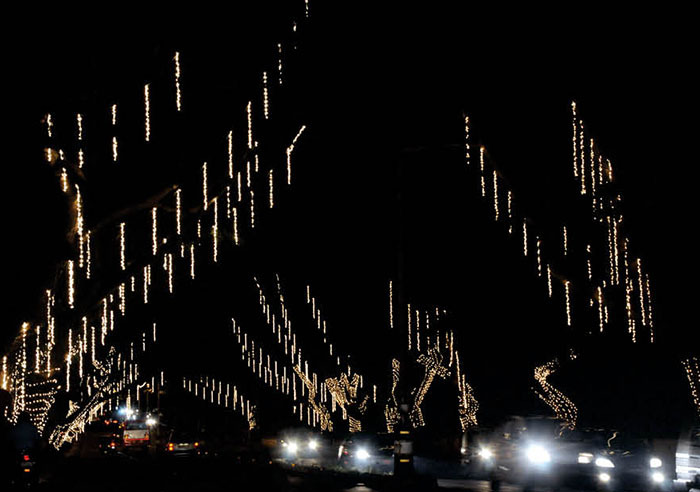 It has taken up illumination in 53 major Circles in around 35 kilometers radius.